A staggering 235,000 people have been diagnosed with diabetes in the last year, Diabetes UK has announced on the launch of Diabetes Week 2016 (12–18 June). The charity is highlighting the scale of the ‘diabetes epidemic’. They estimate that 4,500 people will have been diagnosed with the life-changing condition by the end of Diabetes Week 2016. 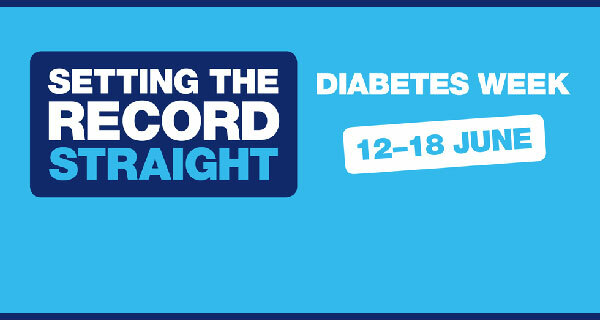 Throughout this week, Diabetes UK and people living with diabetes will be highlighting the many myths and misconceptions that surround this complex and often misunderstood condition in order to drive up awareness. New research released by Diabetes UK shows there is still a lack of understanding surrounding diabetes, with many people not recognising the seriousness of the condition. A recent survey of 1,491 adults in Great Britain aged 15+ found that 53% of people are unaware that poorly managed diabetes can lead to often devastating complications such as heart attack and strokes. The poll also found that one in three people, when asked, thought that it was true that Type 1 diabetes was linked to being overweight, when in fact it is not linked to lifestyle whatsoever and there is nothing that can be done to prevent it. The charity is concerned that confusions such as this could lead to people making false assumptions about the condition and are calling on everyone to become diabetes aware by urging them to take some time this week to learn about the signs and symptoms, especially when Type 2 diabetes can take up to ten years to be diagnosed, unlike Type 1 where symptoms tend to come on rapidly. Chris Askew, Chief Executive of Diabetes UK, said: “This Diabetes Week we are setting the record straight and focusing on the realities of living with the condition. There is still a lack of understanding when it comes to people being aware of the seriousness of diabetes and this worries us at Diabetes UK. "Diabetes doesn't have to hold anyone back"
Despite the stark warning, the charity is also using the week to share many stories from people living with diabetes but who do not let the condition hold them back. Having an illness like diabetes can have a huge impact on your financial situation. The Your situation: Ill, Injured or Disabled' section of our website has useful information on benefits, grants and other forms of support that may be available to you. You may also find other pages of the Your Situation section helpful, depending on your particular circumstances. We also have a Find an Adviser tool to help you find face-to-face advice in your local area.